Yes, I am one of the weird people who really enjoy Fruitcake. I don’t re-gift a good fruitcake. And if my family is well-behaved, I may share with them! I never make my own fruitcake since it takes so long to mature that I never have time, so I usually have to settle with store-bought fruitcake. 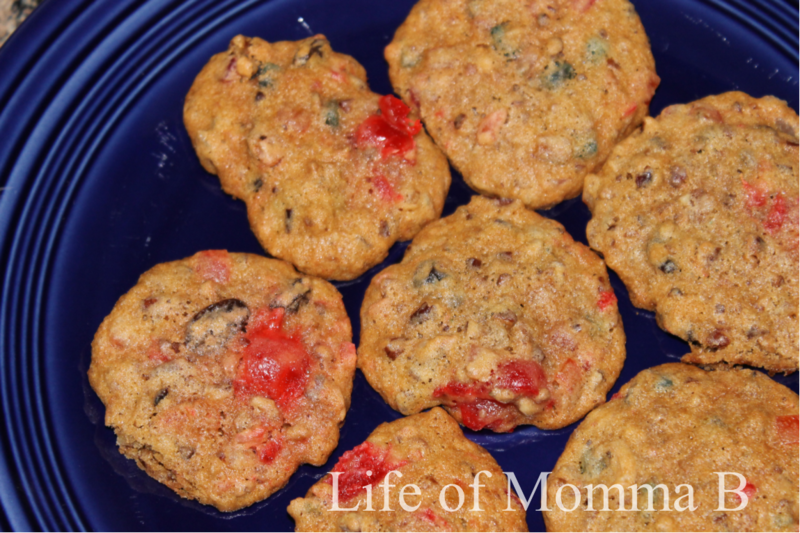 About 5 years ago, I had my first fruit cake cookie. It was made by my aunt’s mother-in-law who does not share any of her recipes. Thankfully, I stumbled upon one in the Christmas Special Edition of Southern Living. Here is my spin. Beat sugar and softened butter at medium speed until fluffy. Add eggs, one at a time. Stir in vanilla. In a separate bowl combine flour, baking soda, cinnamon and nutmeg. Slowly add flour mixture to sugar mixture. Next add fruit and nuts. Drop dough by the spoonful onto a lightly greased baking sheet. Bake 16-20 minutes at 300 or until lightly browned. This entry was posted in Recipes and tagged Christmas, cookies, dessert, printable. Bookmark the permalink.